The hedge fund manager is still considering a move to the place where you can "minimize your taxes" and get a tan. Well, we&apos;ll just have to see about that, won&apos;t we? The dream (of working from the beach and not paying taxes) is not dead! And neither is the American economy! The hedge-fund manager said he’s still considering moving to the Caribbean island from New York after flirting with the idea in 2013…. “You can minimize your taxes in Puerto Rico in ways that you can’t do anywhere else in the world,” Paulson, who manages more than $22 billion of assets, said during a panel….The U.S. is not facing another financial crisis and the stock market&apos;s overreaction to fears about the economy could be a value opportunity, billionaire hedge fund manager John Paulson said…. "Anything you buy goes lower. It&apos;s getting near the point where there&apos;s certainly a lot of value out there." 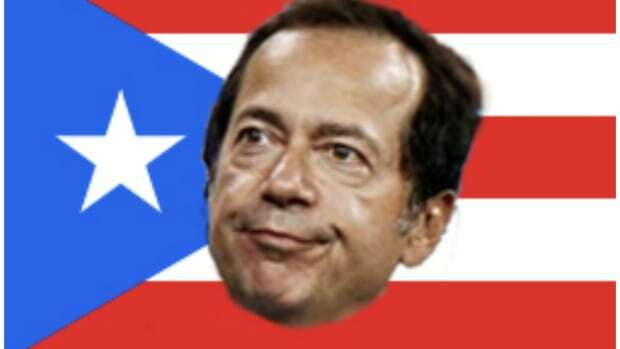 Earlier this month, Bloomberg reported that John Paulson was considering making Puerto Rico his home for a little more than half the year, having been intrigued by the idea of working from the beach and not having to pay capital gains taxes. For its part, PR was pretty excited about the prospect of the hedge fund manager calling the island home on tax forms, as his presence would create a much needed you scratch our back we'll scratch yours situation for the local economy. And while a spokesperson for Paulson has categorically crushed the dreams of the Commonwealth, apparently everyone has gotten over it pretty quickly and would like to make it clear that anyone with money to spend is welcome, nay, encouraged to come on down. Millionaires would be good, billionaires are better but beggars/choosers/etc. Apparently some investors in the hedge fund are willing to stick out bets on Greece and Puerto Rico, while others? Not so much.